Book launches are fun. They are even more fun when you go with friends and quesadillas are being served. This past Saturday my Super Blog Buddy Sarah and I, along with several of the lovely ladies from our local SCBWI attended the book launch for the “The Lunch Thief” (Tilbury House, 2010). 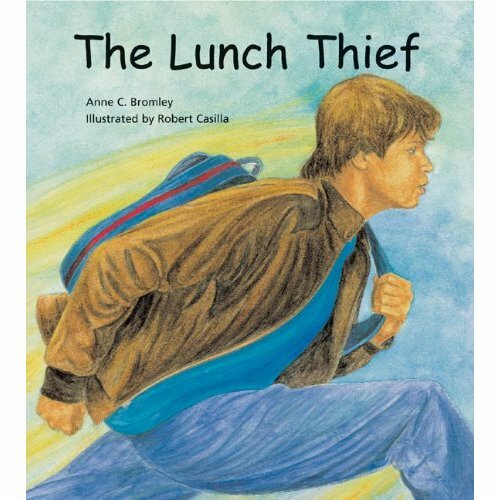 This touching book is written by fellow SCBWI member Anne Bromley and illustrated by Robert Casilla. Rafael is hungry because someone stole his lunch. His mom had packed his lunch bag with two burritos, a bag of corn chips, some carrots, and an apple. Once a week she tucks in a slice of her special lemon pound cake. Rafael saw Kevin, a new kid in his class, sneak his lunch bag from underneath his desk and tuck it in his backpack. But how can he do something about the theft without picking a fight? Inspired by his mother’s advice to use his mouth before his fists, Rafael bides his time, but other kids’ lunches are disappearing, too. On an errand with his mom, Rafael sees Kevin carrying a bundle of laundry into a motel room, and his mom tells him Kevin’s family might be one of the families who lost their homes in the recent wildfires. Rafael rethinks his anger. The next day, instead of accusing Kevin, Rafael invites him to share his lunch, letting him know he’s been caught, but offering friendship as well as a good meal. Big on heart this book helps teach empathy and looking at things from another persons point of view. This would be a great addition to a classroom or school library especially for older children. I can see many lesson plans that can emerge from reading this book. The watercolor illustrations are beautifully rendered and add to the feeling of the story. Aside from the reading and book signing we had an opportunity to eat quesadillas take part in a question and answer period. We learned how the author was inspired by our own local wild fires to write this story and combine it with a message she felt was important to share. It was a great launch and a lovely book, shared with great company…nice job Anne. Thank you so much for your thoughtful and enthusiastic response to the book and the launch party. I’m so glad that you and the other SCBWI members had a good time! Your support means a lot to me. You are more than welcome and congratulations on your book.